What does it take to succeed? What are the secrets of the most successful people? Judging by the popularity of magazines such as Success, Forbes, Inc., and Entrepreneur, there is no shortage of interest in these questions. There is a deep underlying assumption, however, that we can learn from them because it's their personal characteristics--such as talent, skill, mental toughness, hard work, tenacity, optimism, growth mindset, and emotional intelligence-- that got them where they are today. This assumption doesn't only underlie success magazines, but also how we distribute resources in society, from work opportunities to fame to government grants to public policy decisions. We tend to give out resources to those who have a past history of success, and tend to ignore those who have been unsuccessful, assuming that the most successful are also the most competent. But is this assumption correct? I have spent my entire career studying the psychological characteristics that predict achievement and creativity. While I have found that a certain number of traits-- including passion, perseverance, imagination, intellectual curiosity, and openness to experience-- do significantly explain differences in success, I am often intrigued by just how much of the variance is often left unexplained. In recent years, a number of studies and books--including those by risk analyst Nassim Taleb, investment strategist Michael Mauboussin, and economist Richard Frank-- have suggested that luck and opportunity may play a far greater role than we ever realized, across a number of fields, including financial trading, business, sports, art, music, literature, and science. Their argument is not that luck is everything; of course talent matters. Instead, the data suggests that we miss out on a really importance piece of the success picture if we only focus on personal characteristics in attempting to understand the determinants of success. The importance of the hidden dimension of luck raises an intriguing question: Are the most successful people mostly just the luckiest people in our society? If this were even a little bit true, then this would have some significant implications for how we distribute limited resources, and for the potential for the rich and successful to actually benefit society (versus benefiting themselves by getting even more rich and successful). 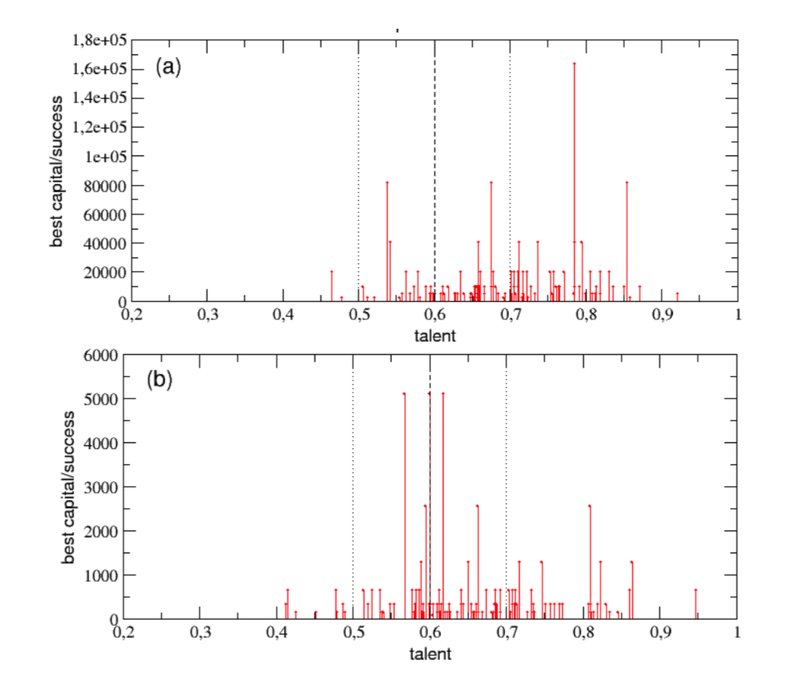 In an attempt to shed light on this heavy issue, the Italian physicists Alessandro Pluchino and Andrea Raspisarda teamed up with the Italian economist Alessio Biondo to make the first ever attempt to quantify the role of luck and talent in successful careers. In their prior work, they warned against a "naive meritocracy", in which people actually fail to give honors and rewards to the most competent people because of their underestimation of the role of randomness among the determinants of success. To formally capture this phenomenon, they proposed a "toy mathematical model" that simulated the evolution of careers of a collective population over a worklife of 40 years (from age 20-60). The Italian researchers stuck a large number of hypothetical individuals ("agents") with different degrees of "talent" into a square world and let their lives unfold over the course of their entire worklife. They defined talent as whatever set of personal characteristics allow a person to exploit lucky opportunities (I've argued elsewhere that this is a reasonable definition of talent). Talent can include traits such as intelligence, skill, motivation, determination, creative thinking, emotional intelligence, etc. The key is that more talented people are going to be more likely to get the most 'bang for their buck' out of a given opportunity (see here for support of this assumption). All agents began the simulation with the same level of success (10 "units"). 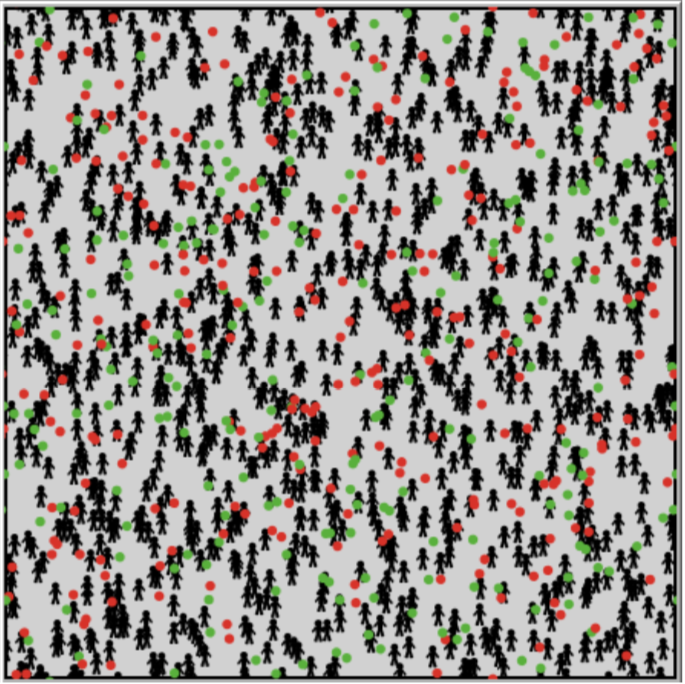 Every 6 months, individuals were exposed to a certain number of lucky events (in green) and a certain amount of unlucky events (in red). 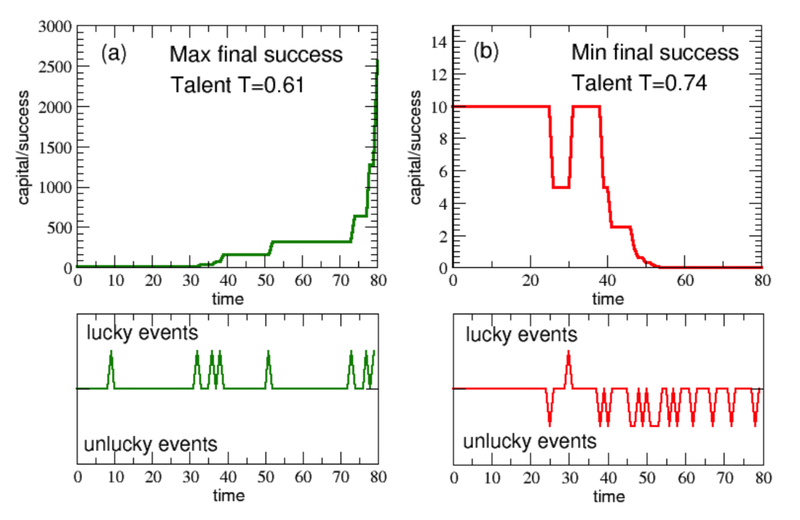 Whenever a person encountered an unlucky event, their success was reduced in half, and whenever a person encountered a lucky event, their success doubled proportional to their talent (to reflect the real-world interaction between talent and opportunity). What did they find? Well, first they replicated the well known "Pareto Principle", which predicts that a small number of people will end up achieving the success of most of the population (Richard Koch refers to it as the "80/20 principle"). 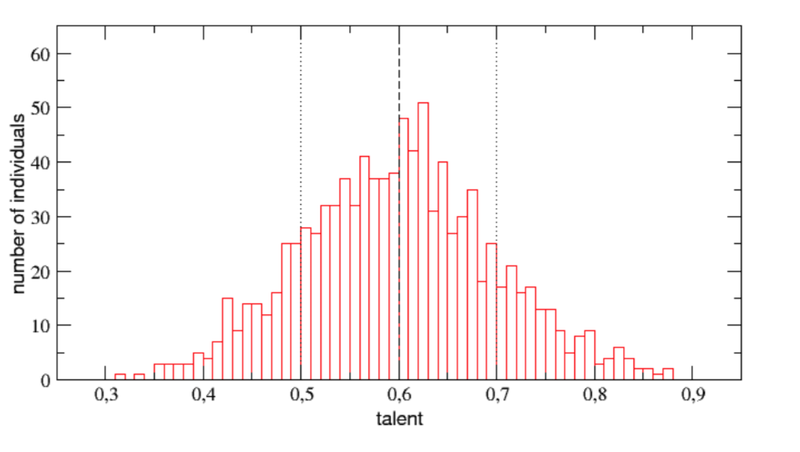 In the final outcome of the 40-year simulation, while talent was normally distributed, success was not. The 20 most successful individuals held 44% of the total amount of success, while almost half of the population remained under 10 units of success (which was the initial starting condition). This is consistent with real-world data, although there is some suggestion that in the real world, wealth success is even more unevenly distributed, with just eight men owning the same wealth as the poorest half of the world. Although such an unequal distribution may seem unfair, it might be justifiable if it turned out that the most successful people were indeed the most talented/competent. So what did the simulation find? On the one hand, talent wasn't irrelevant to success. In general, those with greater talent had a higher probability of increasing their success by exploiting the possibilities offered by luck. Also, the most successful agents were mostly at least average in talent. So talent mattered. However, talent was definitely not sufficient because the most talented individuals were rarely the most successful. In general, mediocre-but-lucky people were much more successful than more-talented-but-unlucky individuals. The most successful agents tended to be those who were only slightly above average in talent but with a lot of luck in their lives. As you can see, the highly successful person in green had a series of very lucky events in their life, whereas the least successful person in red (who was even more talented than the other person) had an unbearable number of unlucky events in their life. As the authors note, "even a great talent becomes useless against the fury of misfortune." Talent loss is obviously unfortunate, to both the individual and to society. So what can be done so that those most capable of capitalizing on their opportunities are given the opportunities they most need to thrive? Let's turn to that next. Many meritocratic strategies used to assign honors, funds, or rewards are often based on the past success of the person. Selecting individuals in this way creates a state of affairs in which the rich get richer and the poor get poorer (often referred to as the "Matthew effect"). But is this the most effective strategy for maximizing potential? Which is a more effective funding strategy for maximizing impact to the world: giving large grants to a few previously successful applicants, or a number of smaller grants to many average-successful people? This is a fundamental question about distribution of resources, which needs to be informed by actual data. Consider a study conducted by Jean-Michel Fortin and David Currie, who looked at whether larger grants lead to larger discoveries. They found a positive, but only very small relationship between funding and impact (as measured by four indices relating to scientific publications). What's more, those who received a second grant were not more productive than those who only received a first grant, and impact was generally a decelerating function of funding. The authors suggest that funding strategies that focus more on targeting diversity than "excellence" are likely to be more productive to society. In a more recent study, researchers looked at the funding provided to 12,720 researchers in Quebec over a fifteen year period. They concluded that "both in terms of the quantity of papers produced and of their scientific impact, the concentration of research funding in the hands of a so-called 'elite' of researchers generally produces diminishing marginal returns." Taking these sort of findings seriously, the European Research Council recently gave the biochemist Ohid Yaqub 1.7 million dollars to properly determine the extent of serendipity in science. Coming up with a multidimensional definition of serendipity, Yaqub pinned down some of the mechanisms by which serendipity in science happens, including astute observation, "controlled sloppiness" (allowing unexpected events to occur while tracking their origins), and the collaborative action of networks of scientists. This is consistent with Dean Simonton's extensive work on the role of serendipity and chance in the evolution of creative and impactful scientific discoveries. Building on this work, the Italian team who simulated the role of luck in success went one step further in their simulation. Playing God (so to speak), they explored the effectiveness of a number of different funding strategies. They applied different strategies every five years during the 40 year worklife of each agent in the simulation. Without any funding at all, we already saw that the most successful agents were very lucky people with about average levels of talent. What happens once they introduced various funding opportunities into the simulation? This table reveals the most efficient funding strategies over the 40 year period in descending order of efficiency (i.e., requiring the least amount of funding for the greatest return on the investment). Starting at the bottom of the list, you can see that the least effective funding strategies are those that give a certain percentage of the funding to only the already most successful individuals. The "mixed" strategies that combine giving a certain percentage to the most successful people and equally distributing the rest is a bit more effective, and distributing funds at random is even more efficient. This last finding is intriguing because it is consistent with other research suggesting that in complex social and economic contexts where chance is likely to play a role, strategies that incorporate randomness can perform better than strategies based on the "naively meritocratic" approach. "[I]f the goal is to reward the most talented person (thus increasing their final level of success), it is much more convenient to distribute periodically (even small) equal amounts of capital to all individuals rather than to give a greater capital only to a small percentage of them, selected through their level of success - already reached - at the moment of the distribution." Look at the difference between the outcome distribution of the environment rich in opportunities for everyone (top) from the outcome distribution of the environment poor in opportunities for everyone (bottom). In the universe simulated at the top, a number of medium to highly talented individuals were able to reach very high levels of success, and the average number of medium-highly talented individuals who reached at least above average levels of success was quite high. In contrast, in the universe simulated at the bottom of the figure, the overall level of success of the society was low, with an average of only 18 individuals able to increase their initial level of success. The results of this elucidating simulation, which dovetail with a growing number of studies based on real-world data, strongly suggest that luck and opportunity play an underappreciated role in determining the final level of individual success. As the researchers point out, since rewards and resources are usually given to those who are already highly rewarded, this often causes a lack of opportunities for those who are most talented (i.e., have the greatest potential to actually benefit from the resources), and it doesn't take into account the important role of luck, which can emerge spontaneously throughout the creative process. The researchers argue that the following factors are all important in giving people more chances of success: a stimulating environment rich in opportunities, a good education, intensive training, and an efficient strategy for the distribution of funds and resources. They argue that at the macro-level of analysis, any policy that can influence these factors will result in greater collective progress and innovation for society (not to mention immense self-actualization of any particular individual). 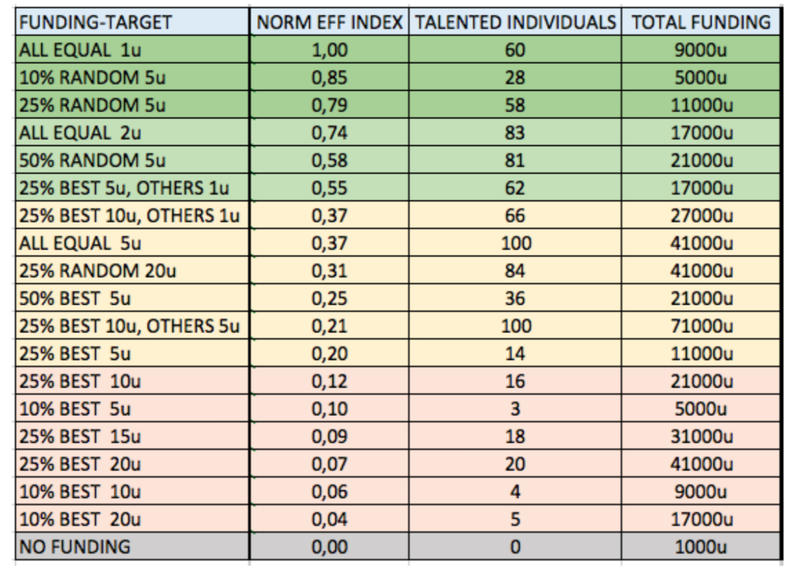 Note: One suggestion I made to the Italian team is for their future simulations to take into account the real-world finding that talent develops over time, and is not a fixed quantity of the individual. They graciously said this was a valid point and would definitely take that into consideration in their future work.